For movement from DC to Store, Integra Crate is the perfect warehouse-to-store solution. These light, flexible containers can be repacked conveniently with clothing, accessories, textiles and other retail products. Being easy to unload, they help minimize time spent at the store. Integra is the right size for manual handling and stacking by one person. With the integrated lid flipped to the closed position, it stacks stably. When nested, the volume of Integra is reduced by 70% due to the Stack - Nest design of the Container. 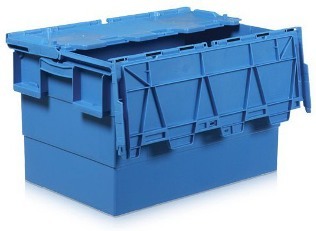 These Crate bins can be used on trollies as a complete materials handling solution for internal movement of goods as well as Returnable Transit Packaging (RTP) solution too.